It has been many years since the LEGO games weren’t linked to movie franchises, safe for the undercover games. Creative freedom is often not found in the latest batch of titles, except for the fact you can bash nearly everything in sight, and unlock a plethora of characters, who will in turn unlock extra items and pathways in levels you have already played. This time LEGO decided to go back to basics, by creating a game which allows you to do what kids still do with LEGO bricks up until this day, build whatever the hell you want. Thus this LEGO game will not feature Batman, Marvel characters or the cast from Harry Potter, it will instead shine a new light on the most important part of the actual toys: The bricks. 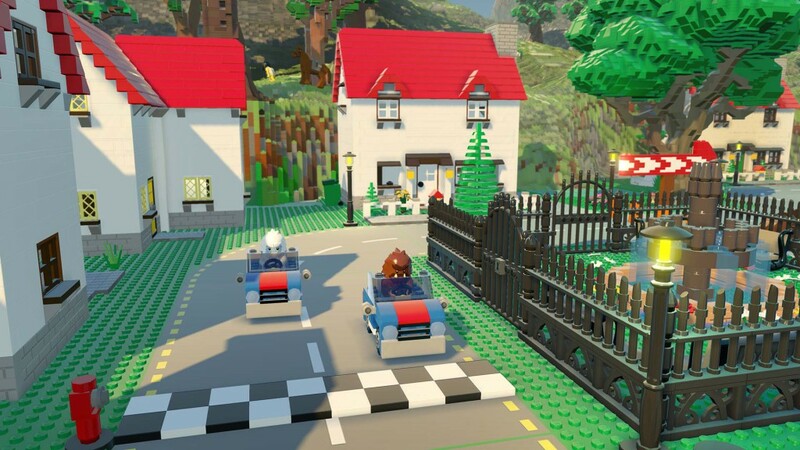 If you’re looking for a story in LEGO Worlds, you’ll be sorely disappointed, as this game is pretty much all about you, and your imagination to build the things you like to build. The latter even allows you to choose from pre-created worlds, which you then can improve, alter, or completely molest (with or without a diabolical laugh in your sofa). That being said, the game paints a certain simplistic setting, in which you are an astronaut, who crashes on a specifically themed LEGO planet, and you’ll have to find all of your builder tools, before the free mode is unlocked. In the end it’s just a pretty way of enshrouding the tutorial into something pleasant, but it’s just that, a small narrative to drive the tutorial. Graphically this game doesn’t differ that much from other LEGO titles when it comes to the characters and vehicles, the worlds however are built with bricks from the littlest plant, to the tallest building. 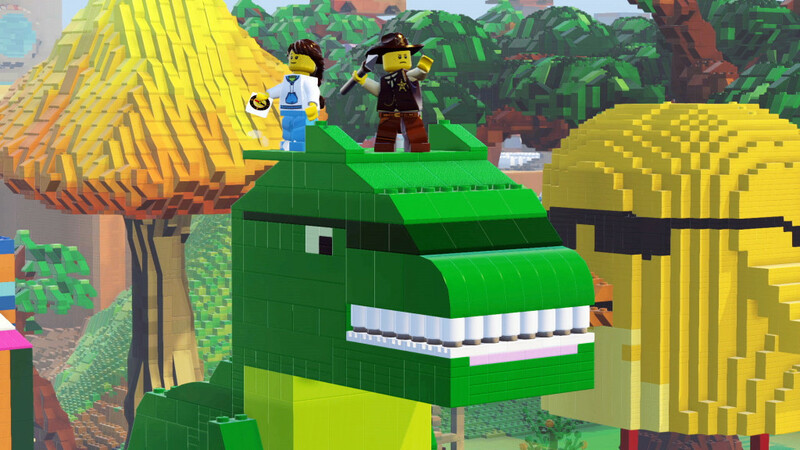 This means that everything you see in the game is created with actual (digital) LEGO, and thus there are no pretty items added to give the game a more cinematic feel, as it is commonly done in the other titles. The fact that every single one of the different worlds you’ll encounter on your travels through space is completely built, brick by brick, makes this game a rather impressive masterpiece, while remaining true to the appeal of the LEGO games that are linked to big movie franchises. Small graphical glitches occur when using some of your creation/destruction tools, which is often simply due to poor camera placement, or the fact the game can’t properly process everything fast enough if you set a tool to its biggest size, and keep holding the creation/destruction option. 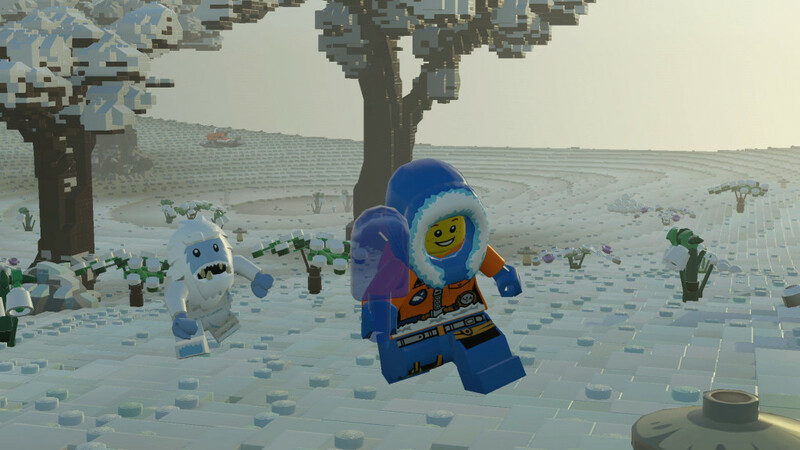 The soundtrack of LEGO Worlds is rather timid which is a step back from the cinematic soundtrack of the other LEGO titles, but still has an air of ‘adventure’ to it. The music aside, everything will eventually be overshadowed by the SFX of you building, or tearing down structures. This department of the game may not be that notable, but it will suffice and never become bothersome during your building sessions. 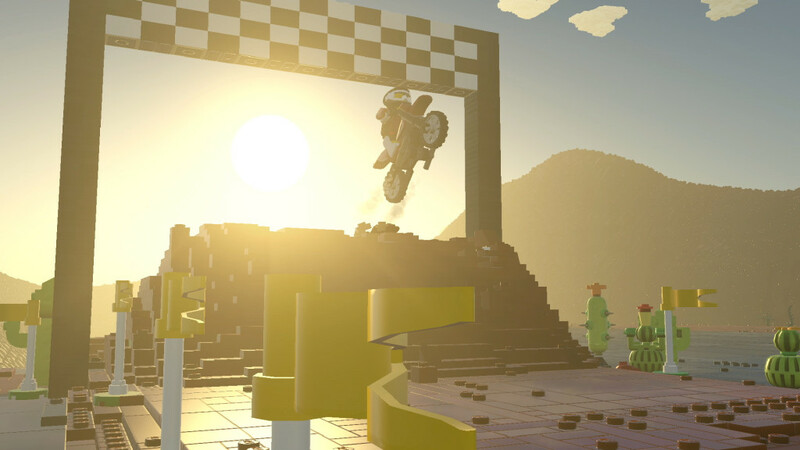 Unlike the other LEGO games, LEGO Worlds is a simulation game, rather than an actual adventure title. 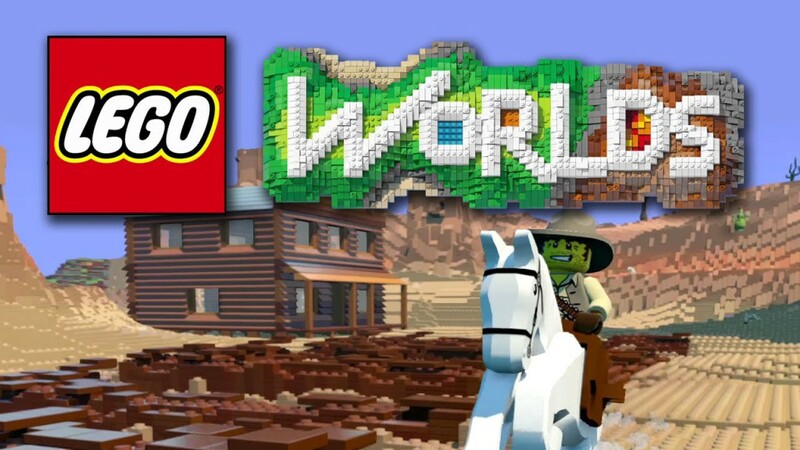 In this game you’ll constantly be dropped on different LEGO ‘worlds’, which each have their own team, be it a giant meadow with many animals, a pirate theme, a construction site, you name it and the game probably has it. In here, you’ll simply be able to manipulate everything in sight, by creating your own structures, destroying others, or simply mess around with the terrain and its inhabitants. Of course, you will not be able to do everything from the start, as you’ll first have to uncover your tools, and afterwards, you’ll always have to scan items, people, animals or vehicles you haven’t seen before to add them to your database. When the latter is done, you can purchase them by paying the right amount of ‘studs’. Having to find and unlock your own items, makes it fun to explore many different worlds before you actually start building monumental structures, or go nuts with the items in your library. Some tools even allow you to scan premade structures (or those of your own) and save them in said library, so you can respawn them later, or simply duplicate said structure wherever you want. This also serves as a handy backup, if you decide to make alterations to an existing design and you end up not liking it. Combat still plays a minor part in this game, as sometimes characters will attack you, especially when you encounter zombies. Nonetheless, this portion of the game is negligible as dying will only cost you a few of your coins, and your attacks are often already gone when you respawn, which makes it feel like an occasional random event, rather than an actual part of the game. It’s quite fun to have to pay attention once in a while when roaming around on a new world though. Controls play a vital key in a game like this, and they suffice in granting you a fairly comfortable gaming experience, but not that much more. More than often the controls when building something feel clumsy, hard to properly aim in the direction you want to, and this is only made worse by extremely awkward camera angles. Overall, some portion of the controls feel as if they weren’t tested, or that the developers did not care at all. Even though we stated earlier that the game is fun to explore, as you’ll have to find and collect everything yourself, it also has a downside for those seeking a Minecraft-like experience, with everything already thrown into their laps might not really like that you start out without any fun items you can build with. You’ll expand your library rather quickly, but even then it’s quite time consuming before you’re actually able to make rather elaborate structures. LEGO Worlds is a delight for those who are looking to put their creative skills to the test in this LEGO version of Minecraft. Nonetheless, those who have been following the LEGO games for some time now, may not completely like this title, as it is void of the adventure aspect that charmed the many previous releases. Those who are looking for a change of pace, or simple good old fashioned LEGO fun, albeit in a digital form, will certainly have a blast with this good looking LEGO ‘simulator’.